I use mine mostly perpendicular, but occasionally I do let it out a bit so that I can 'run' at slight angles in very light winds. I do use mine heavily though when at anchor - see my profile pic. Whats holding me up! I find I am quickest wing on wing if you will when I am +5* to the genoa/jib side of the setup. In mid to upper teen winds, ie 15-20 you may find it useful to attach a tack line to the end of the pole, or some kind of portable 4-1 setup like a main sheet, boom vang setup to hold the pole downward. Keep in mind, the pole needs to stay level as possible. Higher winds will lift the clew end, opening the upper portion of the leech. Really you are doing a makeshift boom vang for the whisker pole if this makes sense. I find by doing this, I can hill hull speed in 3-5 knots less wind than if I am squared to the wind down wind. The whisker pole does need to go a few degrees forward of 90, sometimes as high as upper 70's. I parallel the main boom to the whisker pole as much as possible. Sometimes in this off wind frame, I will actually "center" the main boom 5-10*, this allows the wind from the main to go forward into the genoa giving me another knot or so. My best suggestion on this, is play with the setup in different wind conditions, until you find what works best, take notes etc so you are remembering what really works. What size whisker pole would I need on an SO32? Mine didn't come with one and I have been struggling with downwind sailing all the way. Not sure what your J measure is, but that is a start for min length. I have a J of 11.8feet. Use a 10-18' whisker pole. When using a 110, all the way in works well. Then about 14' for the 155. If you have a 130 or smaller headsail, sometimes getting a J length spin pole works just as well. As they are lighter than a whisker pole. So easier to operate maneuver etc. Even with the pole we are still struggling with downwind. I guess it's to do with needing practice. We do have an easy set up and the pole sets well. Thanks, Ian & Marty. My boat is an SO32 which has the same hull and rig as the SO32i but a different deck layout. So the J size is 11.9ft. Sailing downwind with a pole is much easier because you can tension the genoa and spread it flat before the wind instead of it shutting and filling with every puff. Not sure about the size of the headsail - it hauls out almost up to the standing rigging when set tight on the wind. There is hardly any overlap with the main, although the sheet block is well back on the track. Sounds like you jib is smaller, ie a 110-120 in size. reality is a 12' spin pole might work well. Or go with the 10-18 or the smaller 8-14 size. 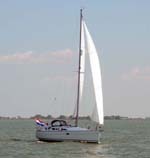 pole diam is also smaller in the shorter version. So it may not be as strong for stronger winds. A larger genoa might be a good addition for down wind work if the current jib is good for upwind. Or a asymmetric spin could be a better option too. Unless the wind is over 25-30 knots, I will use the 155 for down wind, upwind in the 20-30+ range I use the 110. 40+ with a 110 and full main, I've hit 11 knots surfing a 4-6'/1.5-2M wave.....that was hoot! Thanks Marty, it must be a 110. I'll have to look at suitable poles now I know the size I need. For downwind work I have an asymmetric spi - I used it last month in 15 knot winds at sea, without the main (which was fouled, see the cruising thread). We ran like greased lightning. Normally I sail short-handed, so the 110 would be good enough for downwind work. A spin pole might be a good option. Should go on deck and measure diam....3 or 4"....3" is correct......I.think. Why?!? With the spin pole, you cane use with smaller jib. Along with the asymmetric.hook it to.the tack, then pole out that side to opposite of main. This will allow you a bit better straight down wind angles, much.like a symmetric spin can do. To gyre, fall off a bit, remove pole, then gyre as you normally do. Reconnect pole, point down wind a bit more, pull pole to the side. We've had good luck with this approach on my boat. I looked into getting an extending whisker pole but the cost put me off the idea. I didn’t want the weight of a spin pole (as we only have a gennaker anyway), so I got the local rigger to make up a whisker pole. It’s just short of the J measurement so I can ‘dip pole gybe’ it without having to change ends and take it off the mast fitting when gibing. It also stays on the mast track so I’m not tripping over it on deck. I use a downhaul/preventer to stop the pole from coming too far aft and contacting the forward lower stay, so the angle is never 90 degrees. Because we have a high aspect 110 percent jib, I sometimes furl up some of the jib to get a flatter shape (we are cruisers now). We made our whisker pole in 2016. We bought the parts from Z-Spars and the pole from an aluminium supplier in Portugal. We went with the J length. Does your mast already have the track in place?